Why Can’t I Just Be a Christian?” Parakeets make delightful pets. We cage them or clip their wings to keep them where we want them. Scot McKnight contends that many, conservatives and liberals alike, attempt the same thing with the Bible. We all try to tame it. McKnight’s The Blue Parakeet has emerged at the perfect time to cool the flames of a world on fire with contention and controversy. It calls Christians to a way to read the Bible that leads beyond old debates and denominational battles. It calls Christians to stop taming the Bible and to let it speak anew for a new generation. In his books The Jesus Creed and Embracing Grace, Scot McKnight established himself as one of America’s finest Christian thinkers, an author to be reckoned with. 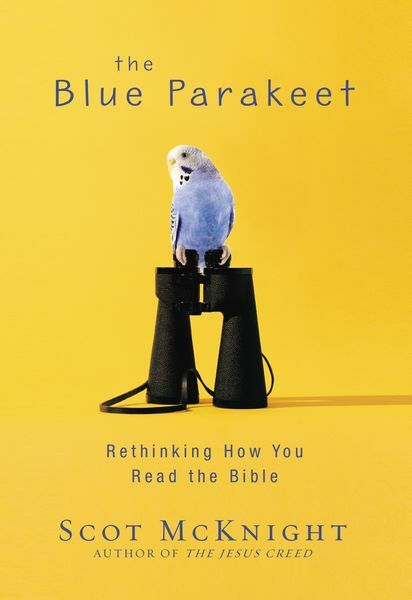 In The Blue Parakeet, McKnight again touches the hearts and minds of today’s Christians, this time challenging them to rethink how to read the Bible, not just to puzzle it together into some systematic theology but to see it as a Story that we’re summoned to enter and to carry forward in our day. In his own inimitable style, McKnight sets traditional and liberal Christianity on its ear, leaving readers equipped, encouraged, and emboldened to be the people of faith they long to be.